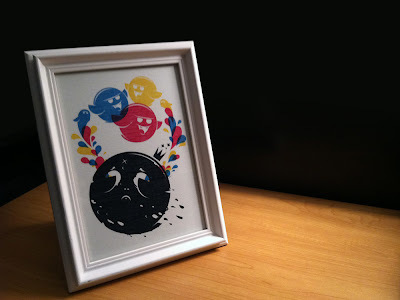 Dan Taub (aka 1oddgent) is quickly becoming one of my favorite etsy artists/sellers. His Mr. Driller-inspired piece, "i <3 air," introduced me to Taub's abilities just over two months ago, while his most recent piece, below, has solidified his brilliance in my mind. Now, I'm not completely sure what's going on in this illustration--are the King Boo's tears creating the primary-colored Boos above/behind him?--but who really cares when said illustration looks so cool, right? Five-inch-by-seven-inch prints (on natural linen paper) can be purchased from the 1oddgent shop for apiece, by the way. While you're there, check out Taub's similarly awesome Tanooki Mario print, too. Labels: 1oddgent, art, Boo, Dan Taub, illustrations, King Boo, nintendo, prints, Super Mario Bros.
Me, too, Anne! Can't wait to see more of them in Super Mario 3D Land. Are you planning to get that game, BTW? Ah, Super Mario 3D Land! I figure I'll pick it up sometime, but I'm not planning on buying it on release, for sure. I tried it at EB Expo last weekend and I was a little on the fence about it. A 2D Mario I understand and appreciate, and Mario Galaxy/Sunshine-type 3D Marios are great too, but this sort of in-between one has me a little unsure. Maybe if I played a bit more I'd get used to it, but it felt a bit odd to me to play a game that was so much like the traditional 2D Mario games but in 3D. Does that make sense? But of course as I said, I'll probably play it sometime... I think I'd go for Mario Kart 7 first though. I wanted to stop by the site (which is great btw) and personally give my thanks to you, and the community, for the kind words and attention brought to "Death, Color, and Ghosts". It means a lot to me and is defiantly a driving force to create new illustrations whenever possible. Oh, and you are dead on about what the piece is about. The passing of one boo ghost gives life to a horde of new, colorful ones. Oh, and thank you for explaining the piece. I was pretty sure that's what it was about, but I wasn't sure.